As a growing number of boomers enter retirement, the investment theme is shifting from accumulation (i.e. building assets for a secure retirement) to decumulation (i.e. using accumulated assets to get a regular income stream). These are two different problems and the latter one is the more challenging, because you not only need to save (i.e. control your expenses)and invest your assets (i.e. long horizon), but you must continue to control expenses, invest(medium to long horizon) and extract regular/adequate income without running out of assets until (the unknown) death. The old model was Defined Benefit (DB) pension plan supplemented by additional savings, some or all of which may have also been annuitized. With the gradual demise of DB plans (at least in the private sector), Defined Contribution (DC) type tax deferred and fully taxable plans retirement plans are the more common means of asset accumulation. Responsibility for saving, investing and decumulating now rests with individuals. In my November 2007 recommendations https://retirementaction.com/Documents/Pension%20Reform.pdf.pdf to the Ontario Expert Commission on Pensions I called this change, herding employees from BAD (DB) plans to WORSE (DC) plans, because individuals no longer have the benefits of professional asset management, low cost and mortality risk sharing. But that‘s another story, and as they say “we are where we are” and let’s see how we move forward, given the scenario that people retire with a retirement pot of money from which they then need to extract an income. We have discussed previously the risks (which were discussed in Life-Cycle Investing ) associated with the various approaches to investing and decumulating in retirement: (1) investment/market risk, (2) inflation risk and (3) longevity risk. In your selected portfolio (asset allocation), the decumulation mechanism and the desired rate at which you are drawing income from it, you can trade off the various risks to some extent. Ideally you are looking to get the maximum possible sustainable real income without seriously jeopardizing the size of any desired estate and, more importantly, you must not run out of money before (the unknown death) death. Retirees/Investors have not been particularly receptive to immediate annuities (one of the mechanisms of mitigating longevity risk) which were the historically assumed approach to the decumulation problem to replace or supplement traditional DB plans. 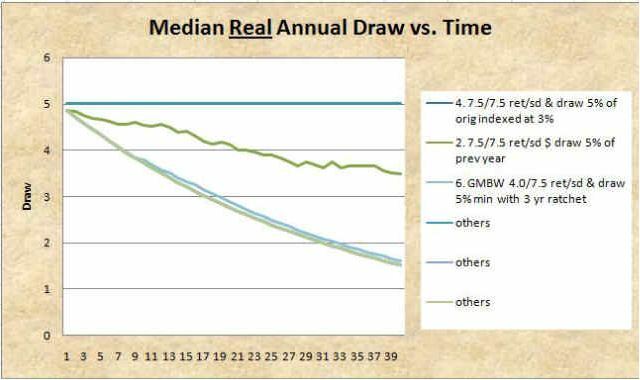 Recently Guaranteed Minimum Withdrawal Benefits (GMWB) have become the hot product that advisors recommend and (conservative) investors increasingly gravitate toward, without really understanding what the apples-to-apples comparison benchmark should be. For example Manulife (IncomePlus), Sun Life (SunWisePlus) and Desjardin (Helios) are three Canadian sources, but they are also available in the U.S. as well. Billions of dollars worth of “investments” were committed in the past couple of years since GMWBs have become available to Canadians. This sounds so good that few can resist. Some of the GMWB plans have accumulated $2-3B in a couple of years. The promise is that you can have your cake and eat it too: guaranteed income for life and market participation! It sounds too good to be true? Well perhaps it is. So what is the catch? It’s the (3-4%/year) fees! Given the typically expected market returns of 7-8%, annual 5% draw and fees in the 3-4% range, you’ll have little or no upside left to work with. Now let’s compare the results of the various Scenarios. Not being a power user of Excel, I tapped into some Excel and Visual Basic pointers from a couple friends (D. A. and M. K.) who by the way bear no responsibility for any of the potential errors or omissions. 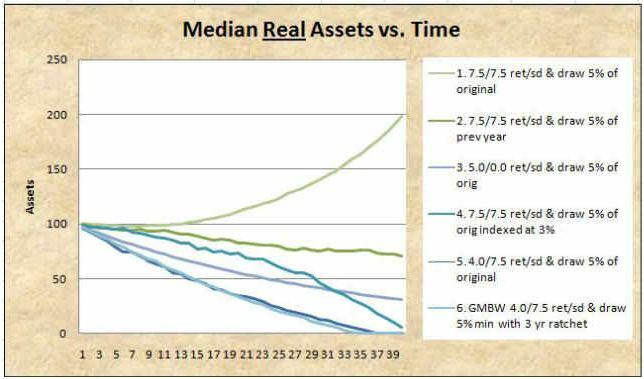 The method used is a Monte Carlo simulation (relatively short runs initially (250) to get a feeling for the general behavior of the various scenarios, but will increase accuracy/number of runs in the future) and measures of goodness chosen initially are the “median” delivered real income and “median” real residual assets. The results will clearly be dependent on the assumption of return, inflation, GMWB specifics and fees. So Scenario #2, a draw of 5% of previous year-end diversified portfolio value, is the best compromise solution between income and residual value. It also never runs out of money (by definition, at least using the assumed bell-curve/Gaussian distribution) and gives one some level of protection against income erosion due to inflation. (This is because on the average offsetting the 7.5% return, there is the 5% inflation and 3% draw resulting in expected 0.5% real asset erosion per year; though this is partly offset by the effective reduction of the draw when previous year’s returns were substandard). Now, one does get some protection from dramatic drop of the equity portion of the portfolio around retirement, though the subsequent lower median draw compared to other scenarios discussed may be too high a price of protection for many investors. For example, if one would do 60% equity and 40% fixed income mix, it would not be unreasonable to expect to achieve the long-term 7.5% annual return with 7.5% standard deviation, assumed for the diversified portfolio. Implementation could be fixed income investments in the tax-sheltered portion of the portfolio and equity in the taxable portion, with annual rebalancing to maintain the mix. (Specific selection of ETFs has been discussed in the Portfolio Management section of this website ). U.S. residents’ implementation may be the same as that of indicated for Canadians. Alternately it may be as simple as using Vanguard’s new Managed Payout Fund(s), though that may result in some loss of tax efficiency, as it is not easy to place fixed income in the tax-sheltered part of the portfolio. This GMWB blog is a work in progress, though since the initial results are somewhat startling, I decided to share them, while I plan to extend the evaluation/comparison in accuracy (e.g. larger sample size) and scope (e.g. other comparatives, such as annuities, longevity-insurance/delayed-payout annuities, other return characteristics, and other success criteria). I read the above with interest, my wife and I fit this senario as if written for us personally. I have had my doubts about our choice of investment since putting a large inheritance sum with an unmentioned national insurance company under the GMWB umbrella. I have always followed my instincts and this time they tingled to not do what we did, but I went ahead anyway not having the time or inclination to learn my options. A representative of the unmentioned company was available, he had dealings with my wife through her place of employment he walked the walk and talked the talk as a retirement investment specialist. Now in hindsight everything that has being going through my mind the last few years, and recent notification of fee increases, makes your comment “if it sounds to good to be true it just might be” sound a little prophetic. Coupled with the rest of your article, (which I am now really trying hard to completely understand), and what our agent has told us during recent portofolio reports, “not to worry, the reports are just unfortunately being issued at the worst possible time”, ie: “market down swings” (they must have it timed perfectly every year that has been his excuse the last three years). To me it has the feel of “the other shoe hitting the floor”, with your article you have dropped it for me I have to say thank-you. I now have faith back in my instincts. My wife and I have come to the conclusion as in all things you have to get yourself educated then pull the trigger. I would not send you into the woods after a hungry bear with a slingshot, that is just what I did to myself though, I walked into the world of retirement investment with little or no knowledge and trusted someone else to make the right decisions for us. I hope we are not to late to educate ourselves, decipher what we have done, discover if it has hurt us, and if it has how much more will it hurt for us to fix it. I will now start by reading what I can understand and by immediately getting second and third opinions on what to do. Many people like ourselves have been finincially comfortable most of our working lives letting our pensions build and saving what we could, all this is childs play compared to being given 7 figures overnight, then wondering what to do with it, then being responsible for making the right decisions at the same time for your children and yourself. As you explain this is a new playing field due somewhat to the the result of property and monies being left to now slightly middleaged Canadians earlier and in greater quanities than past generations. We should not be open to game season, for the walk the talk and talk the walk self-professed retirement investment specialists, representing big well advertised insurance companies. How do the companies they represent somehow gain our trust with little or no personal interaction, just with plenty of hype, promises, and advertising I believe. The answer is actually quite simple if you are an honest person you expect those you interact with honestly to return the favour, how childish is that concept. Or is that just being called Canadian. Think you missed the point, these are guaranteed for life…Only the annuity has this feature and granted with a higher payout. Better comparison may well be a GMWB Lifetime with a 20 year pay annuity. Also at least the GMWB have a potential residual value within the 20 year or possibly longer period while the annuity is guaranteed only to a maximum of 20 years – with an initial lower payout. Where can you find a 5% GIC??? If you are going to use in any comparison I would think your apples to apples should use current 5 year GIC rates which sit around 2.5 to 2.75%. You also neglect the 5% bbonus that is usually added to these products while the income is not drawn. Your 60 year old could in fact wait until age 65 and get an income stream based on no less than 125% of the initial amount. Granted the capital may well be depleted faster if the return has not provided a market value at that level. No one should buy or sell these as a sole retirement solution however these could offer peace of mind for some portion of one’s retirement income stream………They really could be said to act somewhat like a DBP with the possibility of 100% spousal benefit should that option be chosen. Agree with your comment about the 5% GIC’s being history in 2012 (this blog was written over two years ago)…as to residual within 20 years, I wouldn’t count on much given >3% all-in-costs and 5% withdrawals and the ocasional market downdrafts…there is a more detailed quantitaive comparative analysis (of similar vintage) that you might be interested in reading in GMWB II- Guaranteed Minimum Withdrawal Benefit II (https://retirementaction.com/2012/03/05/gmwb-ii-guaranteed-minimum-withdrawal-benefit-ii/ ) and the more recent Vanguard GLWB vs. other decumulation strategies( https://retirementaction.com/2012/03/02/vanguard-glwb/ ). Unfortunately, Vanguards product is only available in the U.S.